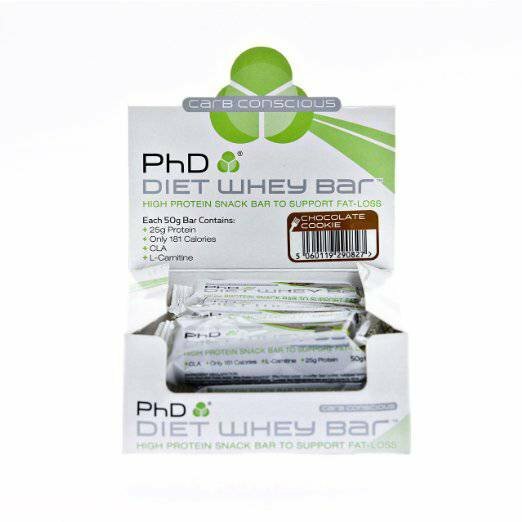 Diet Whey Bar is ideal for men and women following a weight management nutritional plan, slimmers and gym goers looking to lose body fat and control calorie intake, anyone seeking a high protein dietary supplement and anyone looking to replace a meal with a high protein, low sugar nutritional bar. Whey Protein Concentrate: Derived from milk and high in amino acids such as Cysteine and Glutamine, Whey Protein Concentrate is typically comprised of various protein fractions (such as Beta Lactoglobulin) that are being regularly researched and studied for their potential benefits to health and well being. Whey Protein Isolate: Ultra low - fat protein source, low in lactose and containing up t0 90% protein content. Milk Protein Isolate: Typically high in the important Branched Chain Amino Acids (Leucine, Isoleucine and Valine). 1000mg CLA per bar: CLA is a Linoleic fatty acid found traditionally in dairy and fish and has long been used in weight management formulas as an addition, or stand-alone ingredient. 250mg L-Carnitine per bar: In living cells, Carnitine is required for the transport of fatty acids from the cytosol into the mitochondria during the breakdown of lipids (fats) for the generation of metabolic energy. 1000mg Flaxseed powder per bar:Flax seeds contain high levels of fibre as well as lignans, an abundance of micronutrients and omega-3 fatty acids. Studies have shown that flax seeds may lower cholesterol levels. 215ug Chromium per bar: Chromium has been shown to contribute to the maintenance of normal blood glucose levels and also normal macronutrient metabolism. Normal and stable blood glucose levels are very important when following a calorie controlled diet for weight loss.